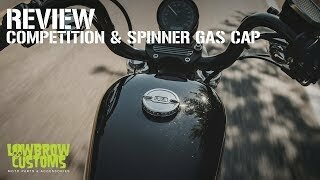 The Spinner Gas Cap from Lowbrow Customs replaces the boring stock cap on your 1996 & later Harley-Davidson motorcycle, as well as many aftermarket gas tanks that take a H-D thread-in style gas cap. A useful feature of these vented, cast aluminum gas caps is the ratcheting mechanism, which allows you to tighten the cap and then rotate it back right to the spot you want it to stay, keeping the design in line with your bike. The soft and supple gasket will ensure no gas will spill from your tank while out riding, no matter how tight the curves. Love it! Works and looks great.Good quality, fast shipping. looks good, it fits, it works, it has kept the gas in. Tip top product delivered by a tip top company!! Fit great! Fast shipping too! Is the gas cap gloss black?